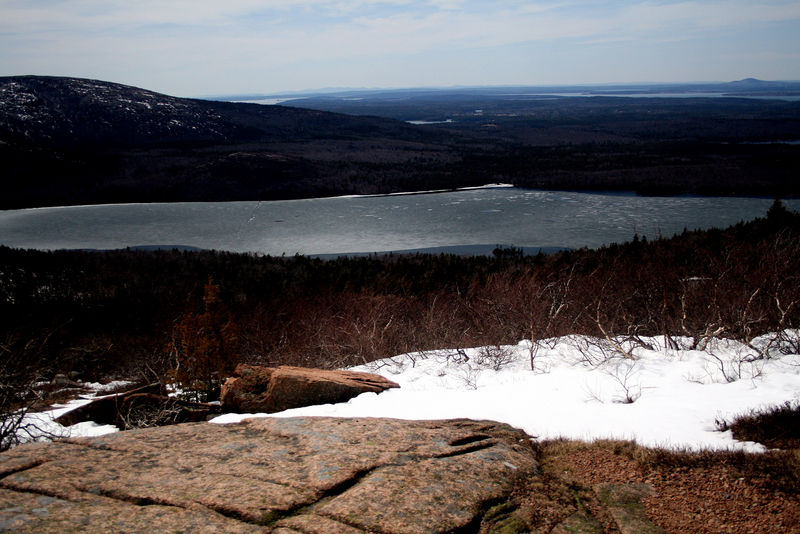 MDI Journal | Thoughts and observations regarding life on Mount Desert Island, Acadia National Park, and all that. Thoughts and observations regarding life on Mount Desert Island, Acadia National Park, and all that. As MDI cycles through the seasons, so do the numbers and activities of its human inhabitants. Over a year, the island goes from a population of about 10,000 in the winter to several times that in the summer. Generally, those of us who live here categorize our fellow humans according to how long they stay here or have lived here. Natives were born on the island. This is the most restrictive category—you either are or are not and that distinction does not change. Even a person born elsewhere in Maine is considered to be “from away.” Locals are those who have moved here, have stayed the entire year, and have lived here for a few years. Summer people are those who own a house or cottage here and who spend varying periods of time here during the season. Tourists stay in hotels, motels, B&Bs, campgrounds, and the like and generally stay here anywhere from a night to two to a week or two. Boat people are those who disembark from the cruise ships that visit the island. In terms of duration of stay, they are the equivalent of mayflies—emerging suddenly in large numbers, fluttering around, and then disappearing (to be followed by another hatch, perhaps the next day). There is another somewhat transitory group that is more difficult to define. It comprises those who come to work here during the season, staffing the shops, restaurants, and lodging establsments; the students at College of the Atlantic; and those who come to Jackson Laboratories on what, basically, are post-doctorate appointments. They may stay for a season or a few years. Some end up not being able to bear the thought of leaving the island and find some way to stay. Some of the restaurants and other businesses on the island have been started by COA graduates or others who just didn’t want to leave. I think that to most of us who live here, the seasonal cycle is rather seamless; one season more or less blends into the next. For the sake of convenience, this chapter will start with Spring. To be really correct, this human-based cycle begins in late winter. Late in February and through March, there are signs of stirring in the village. Dumpsters suddenly appear in front of shops and restaurants as the owners begin the adventure of redecoration or renovation. Sometime around then and continuing through the April Mud Season, the UPS and FedEx trucks become more apparent as they begin to deliver this year’s goods to the shops. As one walks the streets of the village center, one can see people inside the shops, beginning the process of unpacking, cataloging, and stocking. The two local weekly newspapers begin noting the new shops and restaurants that are opening (of course, if you are connected to one or more of the local rumor mills, these articles simply are confirmation). At this point, the pace still is relatively relaxed—after all, it’s still a couple of months before opening. The people you meet on the street are likely to start any conversation with: “So how was your winter?” In the park, the permanent crews are beginning the annual job of cleaning up and trying to ready the park for the opening. There was a time not too long ago when, as soon as the park roads were clear of ice, snow, and debris, the park would open. Now, with the present budgetary restrictions, the opening date is usually targeted for mid-April. Even to accomplish this is no small task. Through the winter, most of the Loop Road as well as all of the road to Cadillac summit was closed; snow and ice accumulated and in some of the deeper, more sheltered and shaded stretches, there was little or no thawing. In addition, winter storms, through high winds and the accumulation of heavy, wet snow, bring down trees on the roads and parking areas. 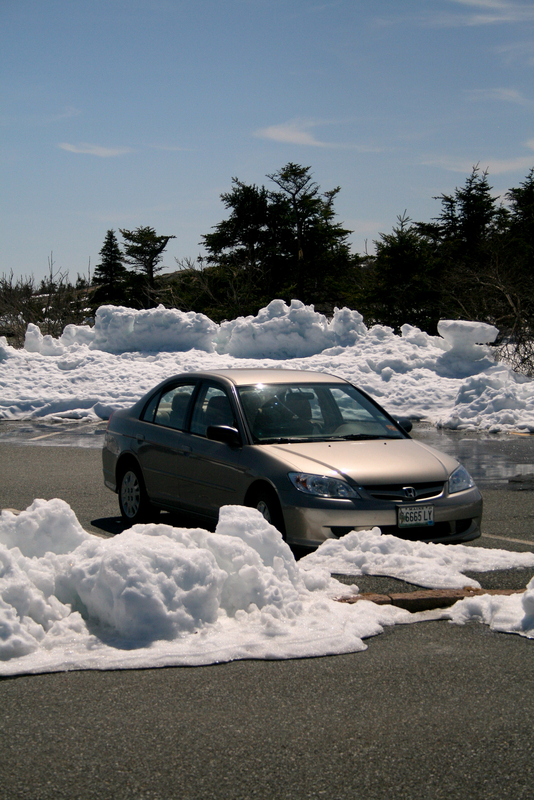 In some areas, the repetitive freezing and thawing loosens large rocks which tumble onto the roads. All of this must be cleared before the park can open. 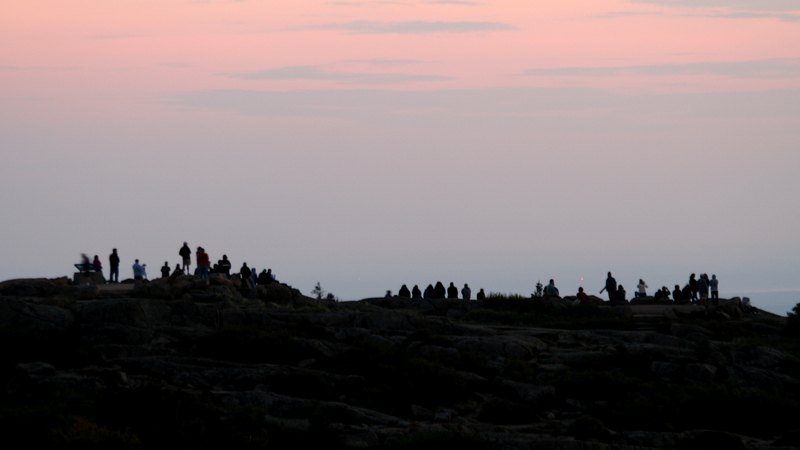 There is a rather long-standing tradition of holding an Easter sunrise service atop Cadillac. However, the weather is not always cooperative and even then, there are times that the liturgical calendar does not jibe with that of the operating budget. At any rate, the opening of the park is an annual event. No fireworks, no parades or political speeches (for which we are thankful), but a lot of people coming into the park and, especially, driving to the Cadillac summit. A ritual it may be, but it is a very free-form and relaxed ritual. With the advent of May, the vegetation begins to show signs of getting with the program. The upper branches of the willows begin to turn yellow, the flower buds on the maples and lilacs begin to swell; a few brave crocuses in sunny, protected spots bloom. This is a good time to be in the park and many take advantage of that. Some of the upper trails may still have snow and ice in spots, others may be wet and boggy in stretches, but this is a time when one can see all of the beautiful and dramatic landforms in the park. As May ends and June arrives, everything begins blooming. It seems like nearly everyone in Bar Harbor has lilacs. Years ago, someone or some group imported lupines—there now are large stands on the island as well as on the mainland. Golden chain trees—another imported species—develop the blooms for which they are named. 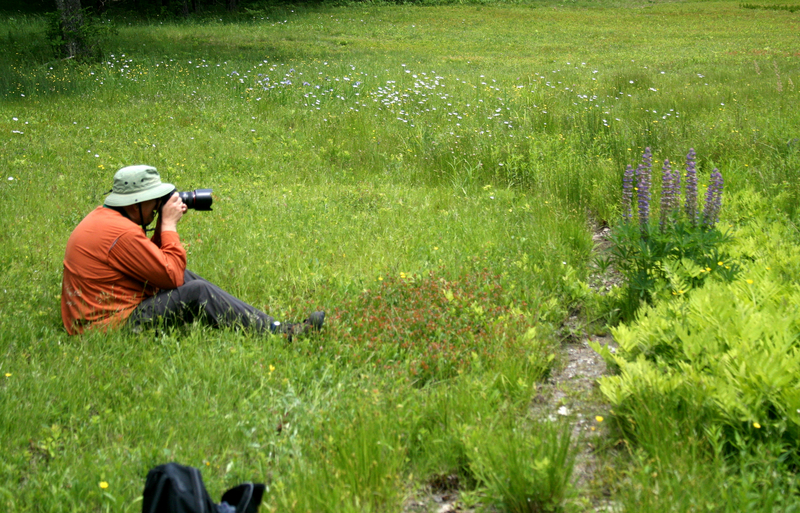 The park becomes a favorite for photographers and for hikers who keep to the lower trails in order to enjoy everything that is blooming. The downside is that May and June also are the principal months for black flies on the island. Small but voracious, these insects hatch from the streams (and probably fresh-water lakes) on the island. Late May and early June are good times to either invest in a lot of industrial-strength repellent or avoid the trails along streams, wetlands, and in the deep forest. 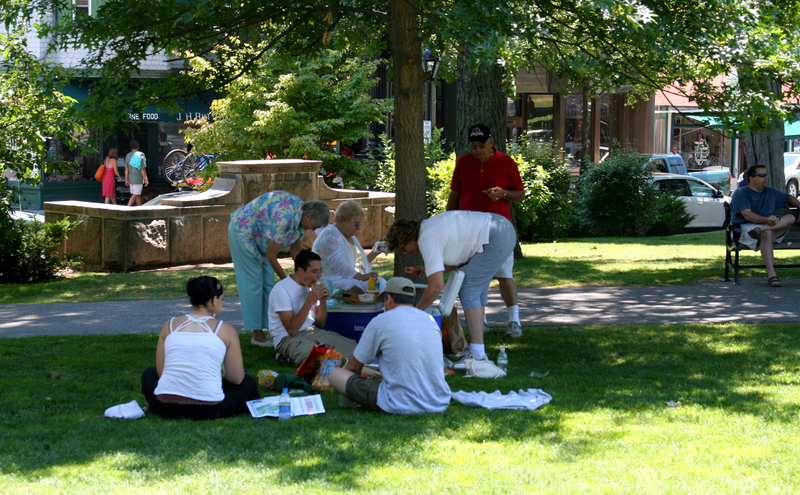 Also by mid-June, Bar Harbor is getting into full swing. With a few exceptions, the shops and restaurants, many of which opened around Mother’s Day but then were open only on weekends, are open through the week. There are more people on the streets and in the park. By the last week of June, tourist demographics begin to switch from couples only to families with children, as the schools begin to let out for the summer. Then comes Summer. Back in the heyday of Bar Harbor, when the wealthy of the East Coast maintained their 20-something room cottages on the island, the Season began on July 4th and ended on Labor Day. Although nowadays the Season has been extended into October owing to our discovery by the leaf-peepers, it seems that The Fourth still marks the start of the season in deadly earnest. Suddenly (and especially on The Fourth), people are everywhere. 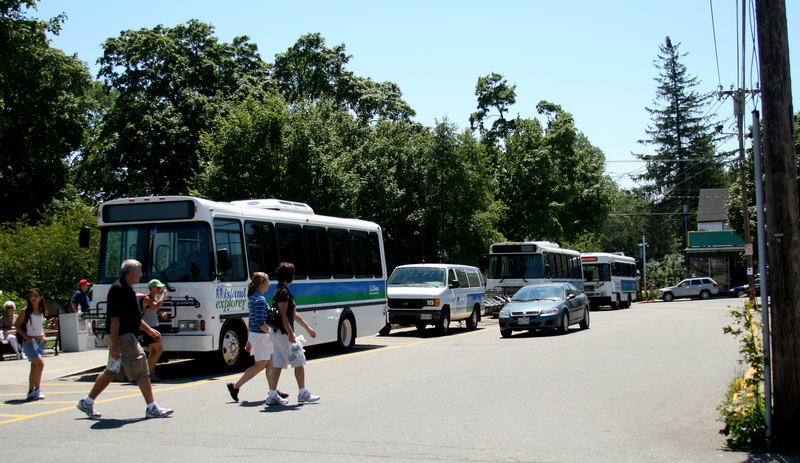 The Island Explorer shuttle buses—the free service that goes nearly everywhere in the park except to the summit of Cadillac Mountain—are busy throughout the day. Bicyclists are making their daily trek—that word was carefully chosen—up the long hill from the village to the Loop Road or to Duck Brook Bridge and the carriage roads. Many of those more experienced in the park use the shuttle buses to carry their bikes into the park or have their own bike carriers on their vehicles. Now is the time of families and sometimes, crowded streets and sidewalks (especially if one of the large cruise ships adds its passengers to the mix). It’s not that there are not relatively quiet places in the village (and certainly in the park), but if one is walking Cottage or Main street, the impression is of a great many people, all intent on some mission, some rather grimly so, it seems. If one can find a place a bit removed from the vehicular and pedestrian traffic, it is a great time for people-watching. 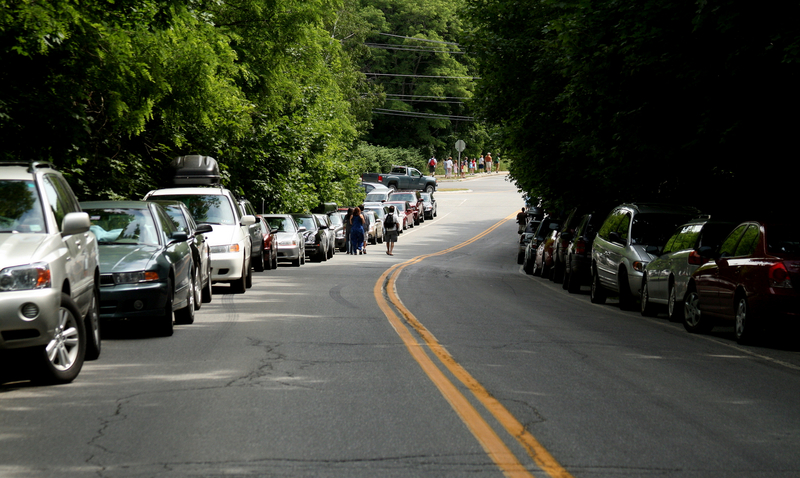 One of the time-honored summer sports is Team Parallel Parking. This is undertaken by those drivers and attendant family who apparently are seldom faced with parallel parking, or usually do so only on quiet streets with little or no competing traffic. The sport consists of the driver having taken position next to a parked car and one or more passengers having disembarked to render assistance. The assistance consists of random waving and considerable shouting as the driver begins the backward journey into the parking spot. The sport becomes even more enthralling if (1) the person rendering assistance assumes a location whereby the driver cannot see them, or (2) two or more “assistants” proceed to give simultaneous and contradictory instructions. If the assistants are truly inspired, the sport can extend through several attempts. At the end, either the vehicle gets parked, more or less near the curb, or everyone jumps back into the vehicle and they go looking for another place to try it again. Unless, of course, the group is from Massachusetts, in which case the vehicle is parked straddling a crosswalk and everyone goes for ice cream. There are two other prevalent activities that have emerged as the technology that they employ has become ubiquitous. The Digital Waltz involves the use of a point-and-shoot digital camera. The dancer, intent on framing the intended image perfectly in the screen, holds the camera approximately ten inches away from his or her face and then, while gazing steadfastly at the screen, moves from side to side and up and back, occasionally bending or stretching. During this, passers-by either stop to witness the performance (I haven’t seen anyone hold up scoring cards yet, but it’s only a matter of time) or take evasive action to avoid being stepped on. The Cell-Phone Shout Out is a favorite of boat people. The object is to find a table in a coffee shop next to people trying to read or get their laptops to work, or stand on the street corner (the really polished performers do so with one foot in the crosswalk, so that the law-abiding drivers come to a halt), and at the top of their lungs, shout into their cell phone: “Hey Maude, guess where I am! Baaah Haabaaaah!” That more of these people do not mysteriously disappear is a tribute to the tolerance of natives and locals. For all intents and purposes, Autumn arrives shortly after Labor Day. Labor Day is when the summer season ends. After two months of wall-to-wall people and vehicles, the week after Labor Day seems almost preternaturally quiet. 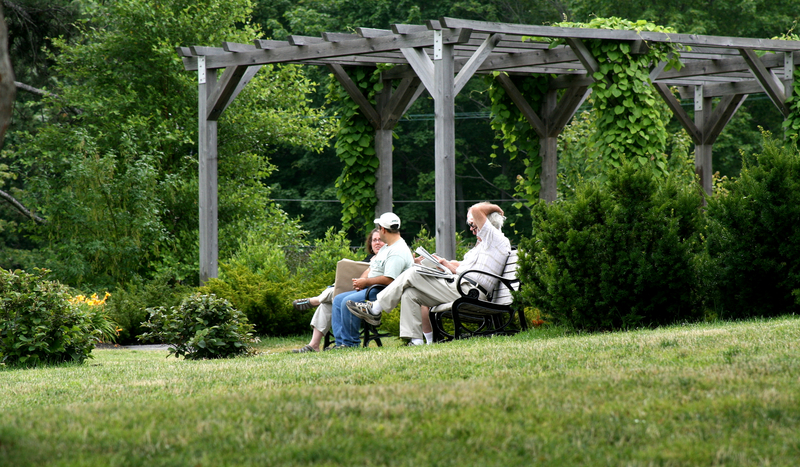 For the B&Bs and other lodging establishments, it usually is a “down time.” The families of July and August have departed and the couples of autumn have yet to arrive. As one walks along the sidewalks, one senses the difference; those who have operated and staffed the businesses through the summer now smile and say “hello.” So many of the things that have preoccupied their thinking and attitudes during the summer have diminished. It is a second wind. 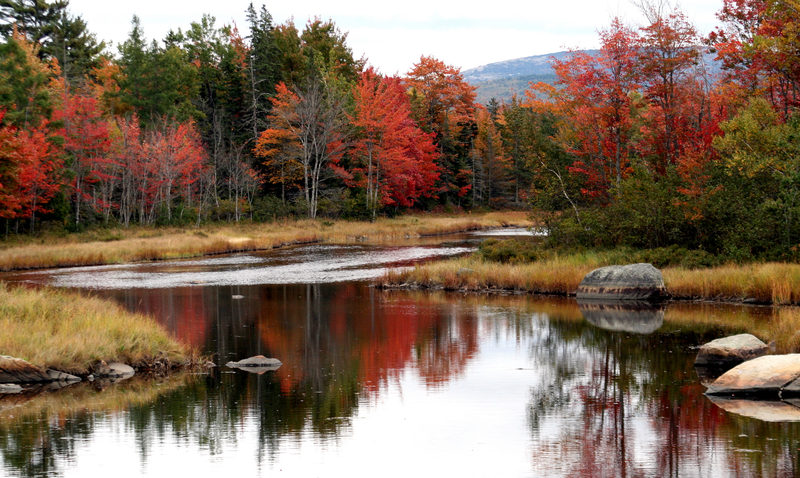 Nothing has changed into fall colors but some of us now begin to look for the first signs—the coloring of individual young red maples along streams and wetlands. Temperatures begin dropping, so that, as in May and early June, early mornings require a light jacket or sweater. Then as September proceeds, the colors of the vegetation begin to change. Still, it is mostly individual trees—and mostly young ones. The visitors again are mostly couples. Cruise ships begin their major onslaught; from early September through the third week of October, we will average somewhat above one ship per day in Bar Harbor, most of these having a capacity of from 1,200 to 3,000 passengers. 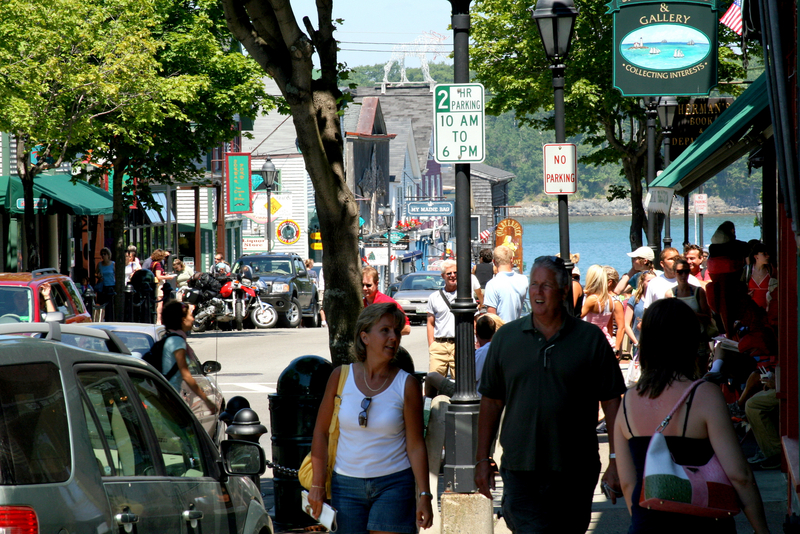 The advent of Bar Harbor as a cruise-ship destination is not without its controversy. Certain types of businesses–some shops near the pier, restaurants that serve lunch (and especially those that specialize in lobster) do well. Lodging establishments and restaurants that specialize in dinners see very little advantage; the boat people don’t stay overnight and the ship usually leaves in the late afternoon. Moreover, some prospective visitors, having heard about the cruise ships, are somewhat anxious about how that will affect their stay in the area. Generally, boat people go in one of two directions: they trudge up the small hill to the shops and restaurants very near the town pier (cell phones and digital cameras in hand) or they board buses to tour the park. In either case, those who hike the trails or walk or cycle the carriage roads seldom see them. In late September and early October, the foliage begins to get serious about changing. In addition, the understory vegetation begins to dwindle so that the view from many of the trails is broadened. Serious hikers and photographers appear from near and far. The air is crisp and clear—a great time for walking or hiking and sometimes, just sitting somewhere on the side or atop a mountain and enjoying. Again, as in the spring, the people one meets on the trails or carriage roads are less concerned with adding this particular walk/climb to their life list or simply to finish it, but rather they are hugely enjoying the experience. With many of them, the envy they express when they find out that you live here is almost embarrassing. The autumn season peaks with the Columbus Day weekend. 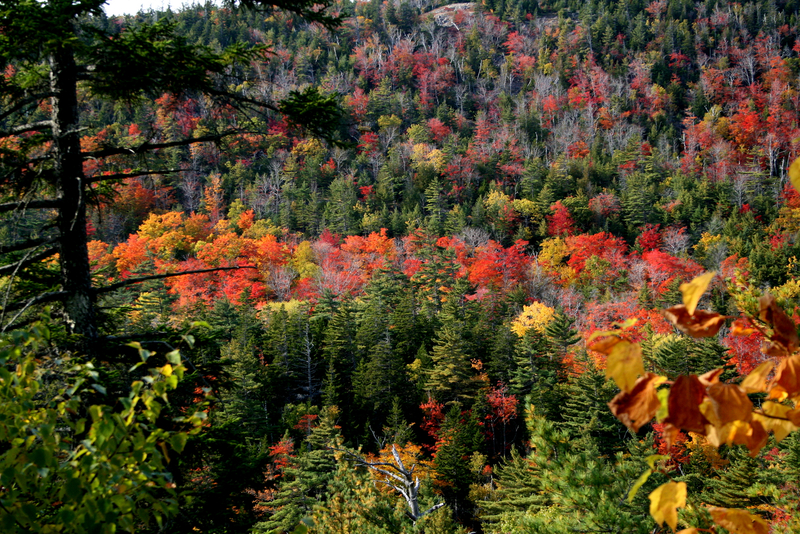 This typically is when the autumn foliage reaches its colorful peak. It also is a busy weekend; not only is it a national holiday here, it also is Canadian Thanksgiving. After Columbus Day, we start to see businesses shut down. For many, how long they remain open depends on the weather because after the holiday, much of the visitation depends on good weekend weather. Autumn gradually makes the transition to Winter. This in truth is a very gradual thing. The leaves begin to fall, the colors change (more about this in the next Chapter). By early November, only the oaks and a few other hardwoods have retained their leaves and color—and this largely depends on whether we have a serious storm. The old saying is that winter can’t come until the ponds are full. There is a lot of truth in this. November, although it can have absolutely gorgeous days that are designed for hiking and enjoying the park, can also have periods of cold, heavy rain and wind—and the ponds and lakes do in fact fill. Early November is a time when the locals seem to hit the park en masse—sort of a “taking the park back” celebration. The landforms of the park—the rocky escarpments, boulder fields, etc.—that largely had disappeared under the screen of summer greenery begin to appear once more. Sometime in November, the park closes the main roads; there always is an announced date with the caveat that an earlier snow/ice storm will result in an earlier closure. Even with the winter closure, the park is accessible. A portion of the Loop Road is open from the entrance station (reached via Schooner Head Road) to Otter Cliffs Road. 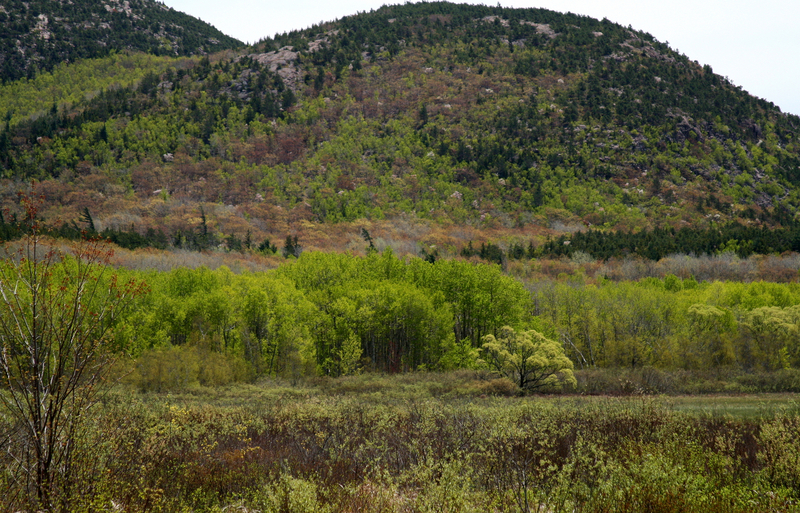 Also, there is access to Jordan Pond via Jordan Pond Road from Seal Harbor. A few restaurants stay open; most of them go to a Thursday-through-Saturday schedule or something similar. A few lodging establishments stay open—motels and small B&Bs—to meet the needs of the occasional visitors to College of the Atlantic, Jackson Laboratories, or those who simply are curious about the island in winter. At some point, usually January but this past year December, the snows hit. During the winter and once the snow has hit, the Loop Road is open to snowmobiles; in that part on the Loop Road that stays open to vehicles, one lane is plowed and the other is left in snow for the snowmobilers. 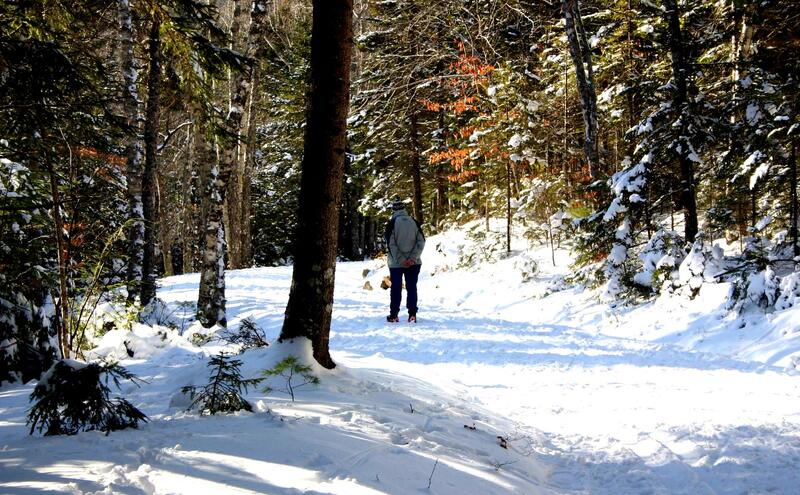 The carriage roads, except for a few short stretches, are reserved for hikers and cross-country skiers. 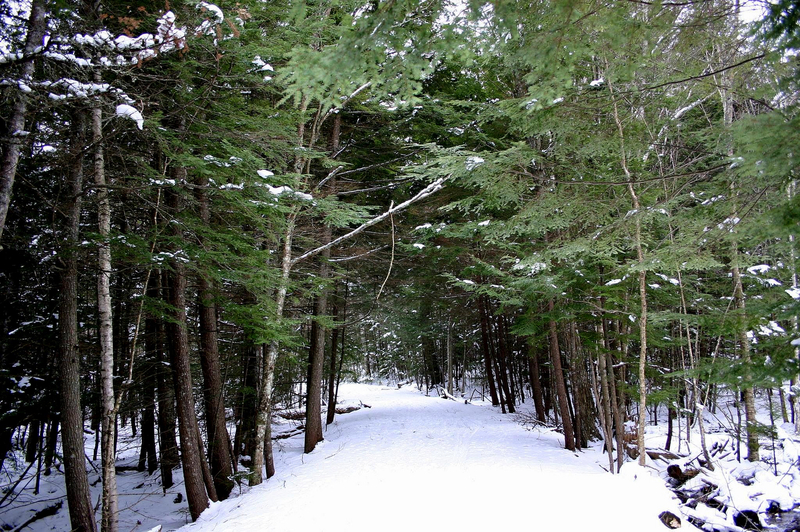 Park personnel and volunteers groom several of the carriage roads for cross-country skiing. Most of the skiing and hiking is done by residents or others who live nearby. We are not a winter-sports destination and probably never will be. 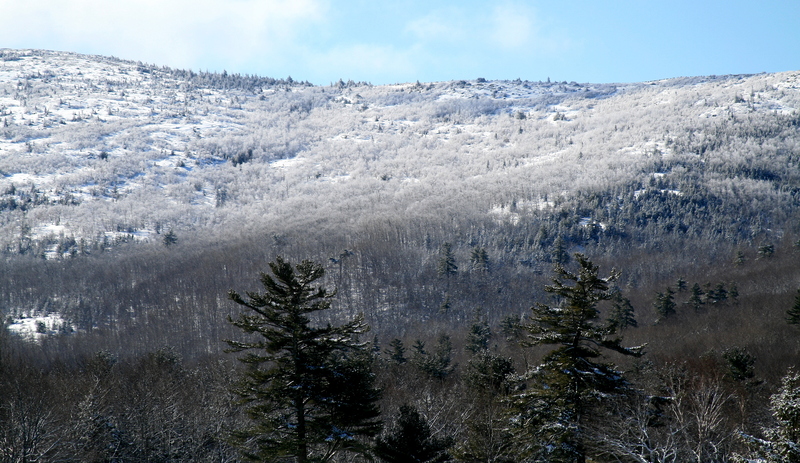 The park in the winter really cannot be described; it must be experienced. All I can say is that during that time in the park, I have never elsewhere experienced such silence, awe, and peace. Eventually, in February and March the snows become heavy enough that all but the most intrepid snowshoers and skiers cannot deal with it. Then it is a bit of a wait until spring, and we begin again. The seasons of MDI, Part I—the natural setting. One of the reasons that we made the move here after about 25 years in the southeast was to get back to an area that had four seasons. Well, MDI (and most of Maine) has five. Starting with the season that most visitors know the best, the sequence is: Summer, Autumn, Winter, Mud, and Spring. Other than Mud, Summer may be the least interesting to me. Everything is unrelievedly green and it is warm. What streams we have are running a low level, if at all. This probably deserves an explanation. 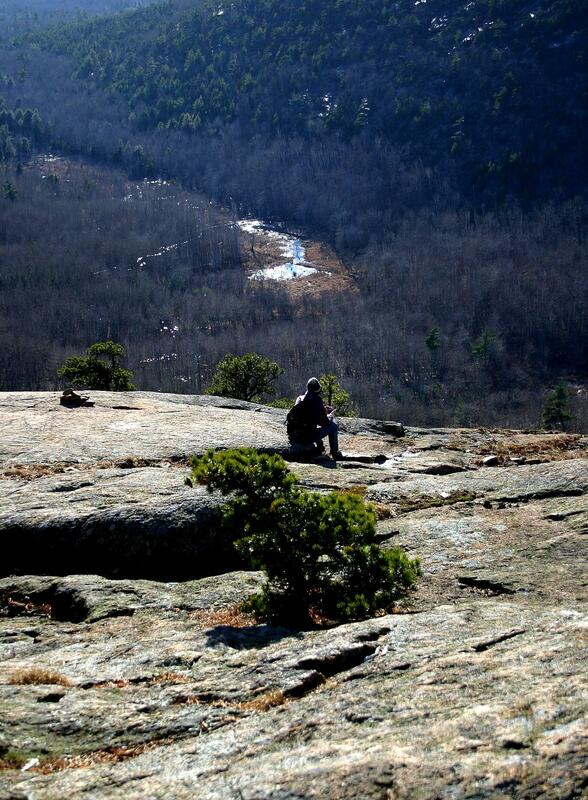 Basically, we sit atop granite, which is one of the more impervious of native rocks. We don’t have much (if any) real subsoil, so except for a few streams that are outlets from the freshwater lakes and ponds, the remainder are fueled by runoff. As spring turns into summer, the rains become less frequent and many streams dry up or nearly so. One saving grace is that as we go further into the summer, the mosquito problem pretty much goes away. Autumn is one of my three favorites. Generally, we are blessed with long autumns. We are virtually surrounded by water; the Atlantic takes longer to cool down (that is a relative term—it never really is warm) and so it modifies our local climate. The air temperatures cool down and the trees begin to color. What is surprising to many visitors at this time of year is that the air itself holds little warmth—the warmth is from the sun—so one can experience a several-degree shift in going from open sunlight to deep shade. Our autumnal foliage season can last for six weeks or more, beginning with the younger hard maples and ending with the oaks (more about that in a later chapter). Of the twelve years that we have lived here, only one autumn was what I would consider a wash-out. That year, we had colder temperatures and a lot of rain; everything was muted and short-lived in terms of color. After a very long autumn, which often extends well into November, Winter occurs. As people who grew up in Wisconsin, winter here was a surprise to us. We already knew (or had heard, anyway) that winters here were relatively mild—again, the influence of the Atlantic. What we were unprepared for was the timing. Where I grew up in northwestern Wisconsin, the snow usually started falling in earnest around Thanksgiving and from then through February, it was deep winter, with Arctic temperatures in January. Here, more likely than not, there is no appreciable snow until January. The major snows happen in February and March; they can be heavy and wet—beautiful, except for the few minutes when one is on the wrong end of a snow shovel. Nonetheless, winter is a magic time here. Although I’m not quite to that point, I can understand the view of some long-time residents that summer is an unfortunate interruption in one’s winter. Sooner or later, the snows cease (or at least diminish) and winter gives way to the Mud season. In other parts of the country, this time is known as April. April showers and all that. In April we still can get the surprise nor’easter that dumps a foot or so of snow—that it may only last a couple of days is precious little consolation. Mud season is bleak. The same Atlantic that blessed us with a long, moderate autumn now is taking one hell of a long time to warm up, and we feel it. Nothing is blooming save late in the month the occasional crocus; the trees are not yet budding. Thankfully, it is a short season; it also is the time when many who stayed through the winter head to warmer climes for a brief stay. Finally, Spring happens. It is magical. Sometime early in May, flowers begin to pop up, trees begin to flower and bud, the frogs along the streams and in the wetlands begin to vocalize. Once it begins to warm up, the vegetation seems to explode as if it has all of this pent-up energy from the winter and mud seasons that must be expressed. Bar Harbor has an abundance of lilacs (our front yard is bordered by about 40); for a couple of weeks, the scent of lilacs is everywhere. Later on, the lupines bloom. In the midst of all this, following the universal rule that there are no unmixed blessings, we have the emergence of the black flies. As nasty as they can be (think of a gnat on steroids), they can be dealt with and mercifully, they are short-lived. And then we are back into summer, and the dance begins again. I’m not a native, nor really a long-time resident of Mount Desert Island. We began coming here some thirty years ago as tourists. We visited every second or third year until I took early retirement from the Tennessee Valley Authority, where I worked, in eastern Tennessee mostly, as a biologist, ecologist, environmental program manager, and staff member of the corporate environmental staff. In 1996, having had all we wanted of the climate in the southeast, we found a modest home here on the island, on the outskirts of Bar Harbor. We have lived here since, year-round. By most standards I guess, that makes us locals. Natives, we will never be, because we were born off-island. What brought us here? Initially, it was the lure of Acadia National Park and also the proximity to Nova Scotia via the now-extinct Bluenose ferry. After that, it was the promise of again having four seasons—something that, having grown up in the upper Midwest (Wisconsin) we both missed in our years in the southeast. Added to that was the friendliness of the people here. Legends abound regarding the dour New Englander. We haven’t met very many. Most of the people here unfailingly have been kind and helpful. If they chuckle at you, they also chuckle at themselves. The humor may be understated and at times a bit sly, but it is there and it is good-hearted. I think that in part, the people here reflect the notion that once all of the tourists leave in November or thereabouts, this is a small community and we all are in it together. So here we are, and have been, for twelve years now. The novelty really hasn’t worn off. We still find ourselves saying that we can’t quite believe that we really live here, that we have Acadia National Park basically as our back yard. There are still times that I stand on a trail or carriage road and am speechless at what I see around me. After having been born in Chicago, grown up in northern Wisconsin, spent years in graduate school in Madison, and spent my professional career in eastern Tennessee, now I feel that I am home. What will follow will be my thoughts and observations on life here throughout the seasons, and on Acadia National Park.